The Barbour Hero Crew Neck T-Shirt adds instant cool to your relaxed weekend casuals. 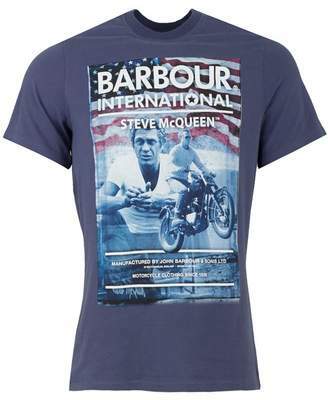 Cut from pure cotton, sporting a ribbed crew neck, short sleeves, a Steve McQueen print to the chest and finished with Barbour International branding. 100% cotton Ribbed crew neck Steve McQueen print to chest Short sleeves Straight hem Machine wash Size and Fit Size photographed: medium Pit to pit: 19"